Heavenly blog! : No. 1662: Israel 70 years - it is God's faithfulness and power that forms the basis of this people! No. 1662: Israel 70 years - it is God's faithfulness and power that forms the basis of this people! Israel 70 years - it is God's faithfulness and power that forms the basis of this People! 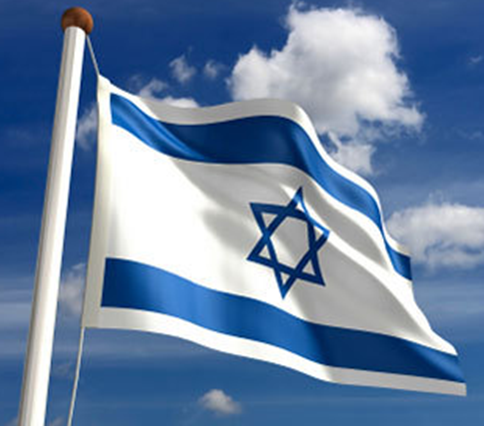 Image of the Israels flag.
. "Do not want to make this article so far too long, because I think this article already contains as much as most people need to read more often and take in what God says about this people. What his view is on this matter, when he is, and he alone who has chosen Israel to be something special. Yes. Jesus went so far to say that salvation comes from the Jews, so salvation for us humans and partake in it is conditional upon recognizing Jesus. But also God's plan and purpose with Israel. Therefore, it is with pleasure that one can congratulate Israel as an independent state, now 70 years old! Joh. 4. 22 You worship what you do not know, we worship what we know; for salvation comes from the Jews. It is and remains the election of God by this people, which makes them so controversial, "hardheads" and to the blessing and later exaltation that they will share. When we pagans will grab an Israelite and will go with him to the house of the Lord and to Jerusalem and worship and honor the Lord both together and in the same place! Isaiah 4 1. And seven women shall take one man in that day, saying, Our own bread will we eat In our own clothes we will dress let's just be called with your name, take away our disgrace! 2 In that day shall the sprout of the LORD be glorious and glorious, and the fruit of the land for pride and for the sake of the remnant of Israel. 3 And it shall come to pass, that whosoever shall remain in Zion, and shall dwell in Jerusalem, shall be called holy, every one that is written unto the life of Jerusalem. 4 When the LORD cleanseth the uncleanness of the daughters of Zion, and cleanseth the blood of Jerusalem from the midst of judgment spirit and cleansing spirit-Why are there seven women? It is obvious that then the world has gone through the great tribulation and there are few people left. In particular, World War I No. 3 people are waiting as the Bible mentions as the Gog War. Together, World War 4, the Armageddon battle. But after this, thousands of years of peace will come with Israel, which is God's great purpose with Israel, in addition to bringing us the people to the Savior Jesus Christ. Beside the Bible and most of the prophets, those who have written the Bible and are spoken in God's own word, they were Israelites. Isaiah 24. 1. Behold, the Lord drains the earth and puts it desolate; He changes his form and adsorbs those who live on it. 2 Then the priest as the people, the lord the servant, the wife as the maid, the seller as the buyer, the borrower as the lender, the governor as his debtor. 3 Empty, yea, the earth shall be emptied, and plundered, and looted; for the Lord has spoken this word. 4 The earth is mourning and fading away; earthly sicknesses and fades away; the utmost of those who dwell on the earth are sickening away. 5 And the earth is profaned among them that dwell therein; for they have violated the laws, transgressed the commandment, broken the eternal covenant. 6 Therefore the curse consumes the earth, and the inhabitants thereof shall be fined; because of this, Jacob's tribulation or the great tribulation, people will suffer when God's judgment goes over the world and especially those who have been neglected to Israel. Jesus tells himself what you have done to one of my least Jews, have you done to him! Matt. 25. 45 Then shall he answer them, saying, Verily I say unto you, What you have not done to one of these least, you have not opposed me. Mostly, it is negative to Israel to be negative to God. Be positive to Israel is the opposite, but salvation is in Jesus Christ. But who saved and redeemed. Then we stand up for Israel and speak their cause! The replacement theology is dangerous and unbiblical. That the church has "replaced" Israel is a lie, we as the church are only parentheses! (Romans 9-11). It is Israel that is, remained and being the people and God's people rather than anyone else in the sense that God has chosen them forever!